Venezuela’s opposition leader has won the support of more countries in his bid to oust the “dictatorship” of President Nicolas Maduro. 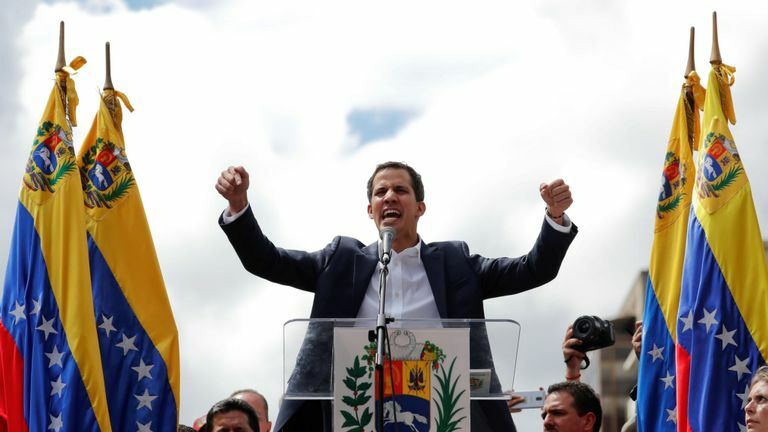 Juan Guaido declared himself interim president on Wednesday, saying the constitution gave him powers to form a transitional government until new elections. 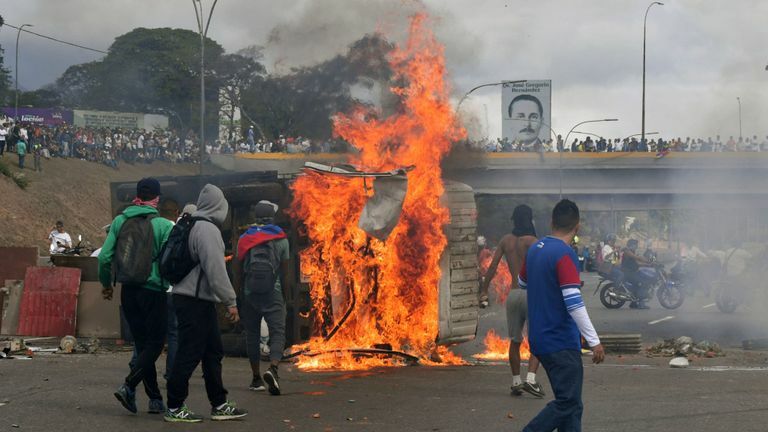 The move has sparked violence in the South American country and at least seven people have been killed in clashes between supporters of the two sides. 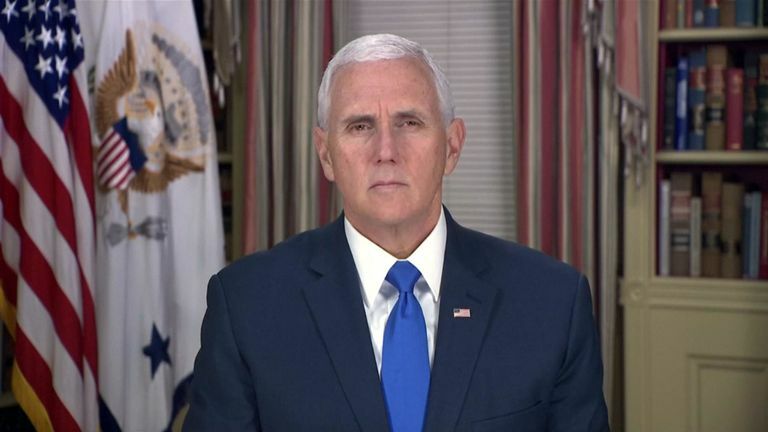 US President Donald Trump said Mr Guaido had “courageously spoken” against Mr Maduro, who was described earlier this week as a dictator by Vice President Mike Pence. Argentina, Brazil, Canada, Paraguay, Costa Rica, Colombia, Canada, Peru, Chile, Guatemala, Honduras have followed America’s lead and backed Mr Guaido. 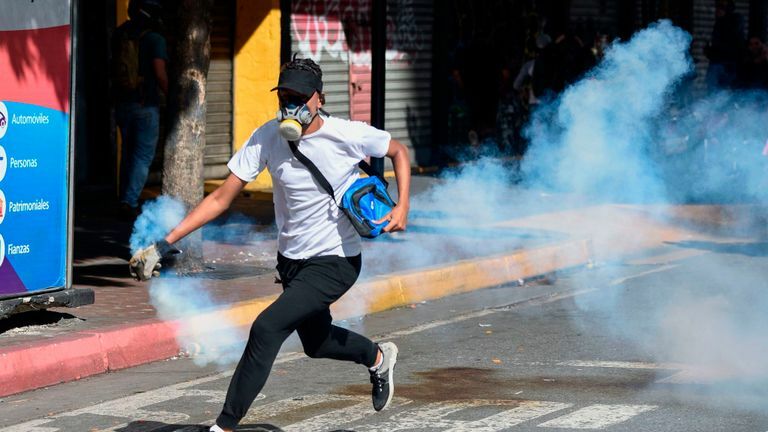 The 35-year-old – the new leader of the opposition-controlled National Assembly – announced his move to cheering supporters in the capital, Caracas – two weeks after Mr Maduro was sworn in for a controversial second term. After claiming the presidency, Mr Guaido told the crowds: “We know that this will have consequences. He pledged to install a transitional government and hold free elections. 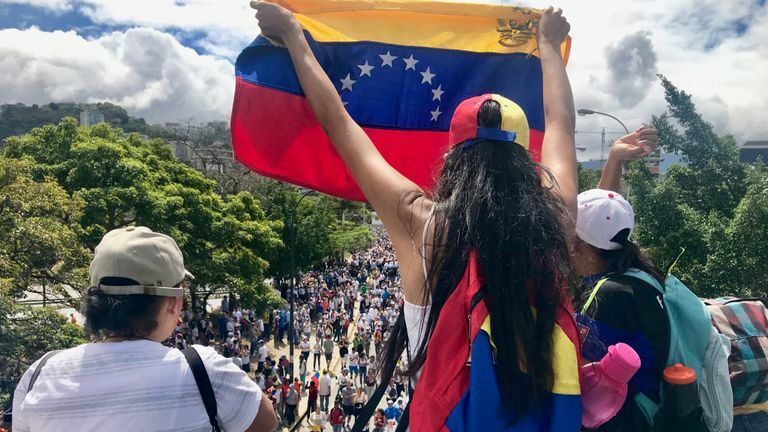 “[Guaido] was surrounded by people screaming ‘president, president’ as he walked through a rallying point,” said Stuart Ramsay, Sky’s chief correspondent, who is in Venezuela. Millions of people have left Venezuela in recent years due to massive inflation and shortages of food and basic medicine. Many of those forced to stay are going hungry. Last May’s election was boycotted by the opposition and Mr Maduro’s strongest opponents were blocked from taking part. The European Union and the US say the result was fraudulent. Mr Maduro responded to America’s backing of his rival by saying he would cut diplomatic relations – giving US officials 72 hours to leave. “I’ve decided to break diplomatic and political relations with the imperialist US government,” he declared. US secretary of state Mike Pompeo has said the US will now conduct relations through Mr Guaido. Mexico, Bolivia, Russia and Turkey have all sided with Mr Maduro. 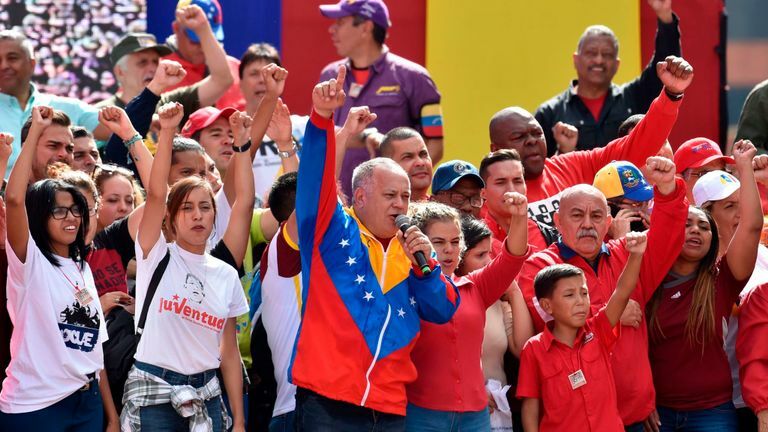 At a rally by socialist party supporters on Wednesday, Vice President Diosdado Cabello called for protection for Mr Maduro from what he said was a US conspiracy to remove him from power. 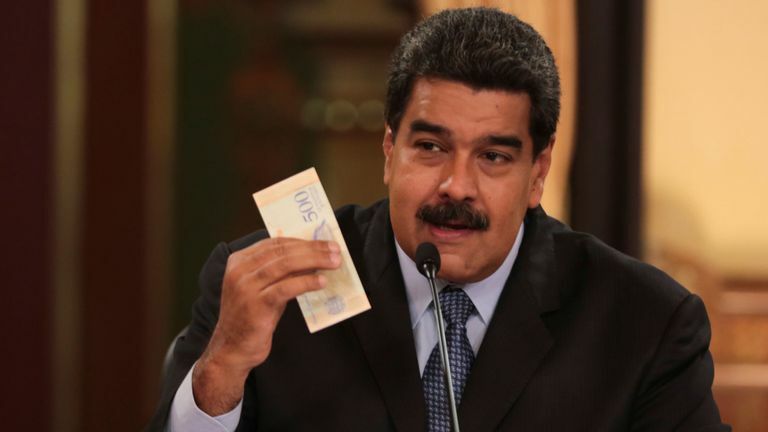 Inflation in Venezuela is predicted to hit 10,000,000% this year, according to the International Monetary Fund. Patrick Duddy, former US ambassador to Venezuela, told Sky News: “It was bad before – it’s dreadful now. Inflation last year was over 1,000,000%. “Oil production plummeted to below 1.2 million barrels per day, it was above three million barrels per day when Chavez took office. The Venezuelan parliament is not likely to convene until Thursday at the earliest.